CBS TV shows in danger of cancellation? CBS is having such a good year that they’re increasing their episode orders for some of their most popular shows, according to EW. The orders total 13.5 more hours of programming. In terms of total airtime, that’s the equivalent to ordering a whole new series. This could mean a few less reruns for viewers… or that the network will be able to dump struggling shows even sooner. CSI: Miami, How I Met Your Mother, NCIS, NCIS: Los Angeles, and Two and a Half Men have all been given orders for two additional episodes each. The Big Bang Theory, Criminal Minds, CSI: Crime Scene Investigation, CSI: NY, The Good Wife, and The Mentalist have each been given one more installment. What about the rest? Are they in danger of being cancelled? Unless their ratings improve, many of them are. Accidentally on Purpose — The sitcom just recently received an order for five more episodes. It’s not a full season order but a positive sign considering the show’s mixed ratings history. It could survive to see a second year but don’t expect any more than 18 installments for this season. 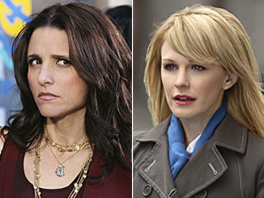 Cold Case — Last season, it was a toss-up between this show and Without a Trace. Cold Case won out but CBS execs may be regretting their choice. Last year, Cold Case averaged a 2.68 rating in the demo and 11.8 million viewers. This season, it’s lost much of its audience in the demo (1.94) and fallen to nine million viewers. Unless things turn around, this show will surely be cancelled. Show support page. Which most deserves to be continued? Gary Unmarried — CBS renewed this series last Spring though the ratings didn’t mandate it. In season one, it averaged a 2.2 in the 18-49 demo. This season, Gary’s been averaging the same which isn’t great. It could be cancelled or it could survive if CBS stick with the Wednesday night sitcom block. Ghost Whisperer — The Friday night drama is way down in the ratings this season. Last season, it averaged a 2.53 in the demo and 10.5 million in total viewers. This year, it’s dropped to a 2.06 rating and 8.36 million. It’s on shaky ground for sure and could be cancelled after this season unless it’s saved to add more episodes to its syndication package. Show support page. Medium — The Patricia Arquette show was saved last season when NBC cancelled it. The deal happened because the show is co-produced in-house by CBS Television Studios and was making money in syndication. Its Friday night numbers are about the same as Ghost Whisperer’s and isn’t safe from the chopping block either. Show support page. The New Adventures of Old Christine — CBS renewed this sitcom last Spring but the ratings weren’t great; 2.1 in the 18-49 demo. This season, it’s been averaging a 2.0. It could be cancelled but is co-produced by CBS and is more likely to survive so that there will be enough episodes for syndication. Numb3rs — This is another Friday night show that’s been struggling this season. CBS has just cut its episode order for the season and it looks like a shoe-in for cancellation. Show support page. Three Rivers — This Sunday night drama has been struggling in the ratings from the start. It isn’t expected to survive past 13 episodes. Show support page. What do you think? Are any of the endangered shows worth saving? Note: Some of the 2008-09 demo ratings listed were initially incorrect and have since been updated. cold case is the best series ever,you really need to keep it on,there are 6 of us that get together and watch cold case every week, and we dont want to keep watching reruns, there good but, we need new ones to watch. my whole family watches cold case and believe me I have a big family. you made a mistake in cancelling “Flashpoint”. This was on eof the best show for the summer. You should give this show a anothe chance. a old person and these shows keep me going.Also everyone I talk to Love these shows. Need more marathons on week ends with new episodes also Flashpoint was a good show and I was just getting in with the Gifted Man.Csi Miami and Csi Ny this are all great shows.Please keep them coming.